Each year a select group of students will join a cohort dedicated to cultivating an entrepreneurial mindset. After being selected for the program, students will choose the impact group in which they want to participate. Each impact group will have a professional mentor to meet with throughout the semester, and will have the continued support of their peer relationships within the group. 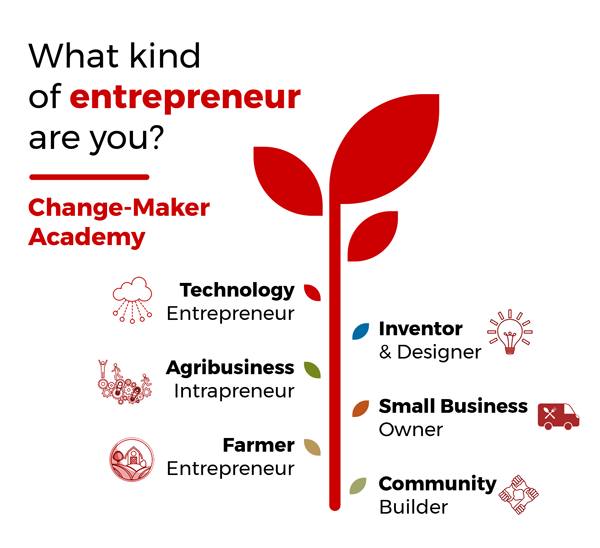 To complete the program and receive a scholarship, students will be required to engage in a minimum number of Change-Maker workshops or AgEI programs during the academic year. Questions: Matt Clancy, mclancy@iastate.edu , (515) 294-1802. Planned Change-Maker Workshop categories included the following. The Change-Makers application deadline has passed for this year.